There are 817 items available. Please enter a number less than or equal to 817. A+ Fast shipping, will continue doing business. A Great Bargain, Item as Described, Thanks a Million !!!! My son is very happy with this neck strap. Exactly as described, it's comfortable and does the job well. I got this strap for a student sax because it was made of the style like protec neck straps I own, but one side is twisted so the adjuster will sit flush. I don't like the twist that way because the straps don't sit flush on my collar bone. I'd rather have the adjuster be horrizontal and the straps both sit flat when in use. During the first week of use, and it won't hold it's adjustment. I like the sliding closed spring loaded hook so it won't fall off the strap ring on the horn body. The hook is thin on this unit. 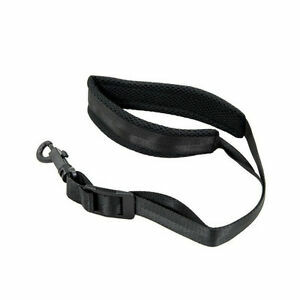 The pad that goes behind your neck needs to be stiffer for better weight distribution, but the strap is good and wide.